We have something so special here! May 2014 bring us all much joy and happiness! and may your dreams come true also! From the opening Christmas party scene to the magnificent pas de deux of Act II, danced by the Sugarplum Fairy and her Cavalier, the recent performances of The Nutcracker by the Coasting Along Theatre Society were an artistic and technical success. The young cast of local dancers put their hearts and souls into putting before an audience what they had been rehearsing every weekend since mid-September, and they can be very proud of their achievement. In the first act, who could not chuckle at Fritz (Halle Holmes) and Drosselmeyer’s (John Conway) eye-to-eye challenge, or the mice stretcher bearers confidently marching off the stage with the Mouse King (Jarrett Carlington) still lying on the stage floor. Who could not be impressed as Herr Drosselmeyer entertained the party guests with his juggling and dancing dolls, the Jester, the Ballerina and the Harlequin, ably performed by Wyatt Henley, Jaime Butler and Kristie Sita. The role of Clara was danced superbly by Brontë Hansen, whose infectious smile and strong acting kept our attention throughout. In the exciting confrontation between the Mouse King with his host of little mice and the Nutcracker Prince (Luke Hanson) with his marching soldiers, Clara saves her Prince, the Nutcracker springs to life, and we enter an enchanting dream world, Clara’s dream world. The costumes were colourful and tasteful and nowhere was this more evident than in Act I, Scene III where we were transported to the Land of Snow. The blue and white designs in the scenery were echoed in the blues and silvers in the costumes. Kudos to Cody Chancellor for the set designs and art work and to Conchita Harding for the costume designs and the many hours of assembly. In this Land of Snow, the Snow King and his Queen, danced by Diego Ramalho and Ana Paula Oioli, gave us an exquisite pas de deux accompanied by swirling dancing snowflakes. As “real” snowflakes floated down on the dancers, we were presented with an ethereal picture of a perfect winter scene. In Act II, Clara and Drosselmeyer are transported to the Land of Sweets, and a series of dances representing different nationalities. The curtain opens on six little angels seeming to float effortlessly around the stage in a realistic ground cover of cloud. Two red-clad Spanish dancers (Elizabeth Waite and Lily Riggs) gave us a lively fandango, followed by a slow, sinuous Arabian dance (led by Courtney Hobson) and then a pair of ribbon-wielding dancers (Cora Nelson and Evangeline Larson) symbolizing China. Two somewhat inebriated Russians (Luke Hanson and Jarrett Carlington) doing a lively trepak and some highly amusing tumbling were followed by the Mirlitons, a trio with a lucky male dancer (Diego Ramalho) and two lovely companions (Jamie Butler and Stephanie Millican). He successfully satisfied both dancers with some expert partnering. A hit of the show was Mother Ginger and her Pulchinelles. The imposing stilt dancer, Pan Willson, herded the young brood through some tumbling manoeuvres after which they gracefully exited by sliding between a pair of outsized legs. One of the most memorable bits of music from The Nutcracker is surely the Waltz of the Flowers. Here this music accompanied some delicate, elegant dancing. The Dew Drop Fairy, danced by Ana Paula Oioli in her second role, added some stylish solo steps. The high point of the ballet is the pas de deux of the Sugarplum Fairy and her Cavalier, danced by Emilie Siqueira and Miguel Nguyen. They gave us moments of exquisite partnering along with spectacular solo work, a beautiful moment well worth anticipating. The production was in the hands of the company’s artistic director, Kathleen Holmes. From the recruitment of an enthusiastic team of volunteers to the many hours of rehearsals that brought the dancers to their high level of artistry, Holmes deserves the highest accolades. If you missed the performances, mark your calendars now for the 2014 version. The Nutcracker is a holiday staple for young and old and indeed adds a magical touch to Christmas. 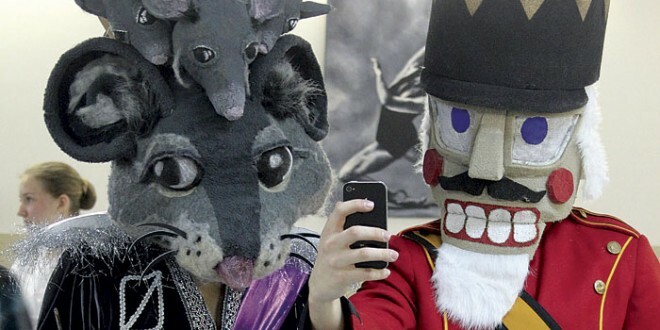 Local dancers Jarrett Carlington (the Mouse King) and Luke Hanson pause for a ‘selfie’ during one of the first full dress rehearsals of Coasting Along Theatre’s production of The Nutcracker. 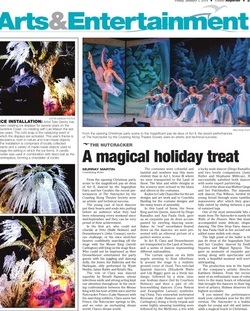 Tchaikovsky’s Christmas ballet will be showcased during six performances at Raven’s Cry Theatre December 28 to 31. The central part of Clara will be danced by Bronte Hanson, with John Conway appearing as her godfather, the sinister toymaker Herr Drosselmeyer. Building on the 2013 production and vision of the late David Holmes, this year’s Nutcracker offers more lush costumes, embellished sets and a larger stage to tell the classic holiday story of Clara and her enchanted toy. Professional guest artists return to dance the major roles and mentor the young performers. Coast City Ballet’s Miguel Nguyen returns, with an athletic macho grace as he reprises the Cavalier role; Emilie Siqueira is a delicious Sugar Plum Fairy, and Ana Paul Oioli performs the dual roles of Snow Queen (opposite Diego Ramalho as Snow King) and the Dew Drop Fairy. 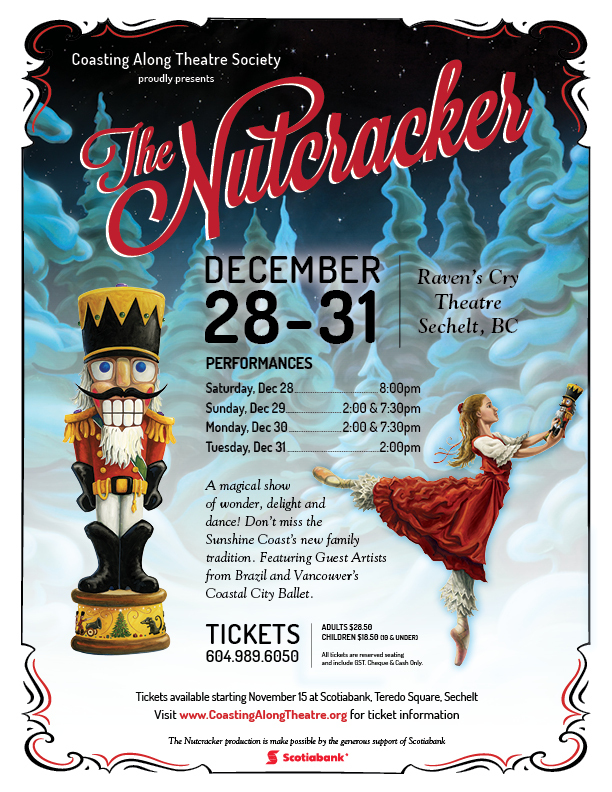 Holmes conceived of a Coastal production of The Nutcracker in 2013, brought Scotiabank on board as sponsors, Conchita Harding as costume designer, and taught a host of young dancers how the steps they had learned in class translated into a full routine. “David liked to make something out of nothing,” his wife and fellow teacher Kathleen Holmes noted recently. Holmes’ legacy is now a full-fledged Coast holiday tradition. Tickets for reserved seating are still available at Scotiabank. Our Nutcracker Promo Video - footage from 2012 by Dan Tsuji! What is the magic of The Nutcracker? First and foremost it is the score. There is, indeed, an eternal enchantment in that music, which was written by Tchaikovsky in 1891. It is impossible not to respond to the delicate, swelling joy of “The Waltz of the Flowers”, or the “Snowflakes” dance that shimmers like sunlight on frost. It is the childlike sensibility to which The Nutcracker speaks. It is taking us back to a time of innocence, a time with no worries, a time when you believe completely in Christmas. Compared with the mythic tragedies of Swan Lake or Giselle, or with the great 20th-century works that reveal ballet’s singular ability to portray character, The Nutcracker is of course almost ludicrously basic. The story – Clara is given a nutcracker toy that comes alive and accompanies her on a journey to the bright-coloured land of the Kingdom of the Sweets – has no dimensions to speak of. Yet in its very simplicity lies its power. The first act, that wonderfully ordered party at the Stahlbaum home, with the gleaming tree at the back of the stage, creates a perfect image of Christmas. The second act creates a perfect dream world. The Nutcracker should cause children to feel wonderment and adults to feel like children: in this respect it is exactly like Christmas itself. It understands, as The Nutcracker should, that in the end its magic lies in creating a vision of crystalline perfection, embodied by the balletic art itself. Clara, running across the stage in her pure white nightgown with her feet effortlessly pointed, is every would-be ballerina in the audience, and the Sugar Plum Fairy is the glittering image to which she aspires. These are the unspoken childhood dreams that infuse the theatre, as surely as those of Christmas. Check out The Nutcracker 2012 tab - photos, videos, and a photographic documentary of the making of our Nutcracker. For more info - please contact Kathleen Holmes at 604-989-6050 or kdhhHolmes@gmail.com.